Our product range includes a wide range of stainless steel coils. 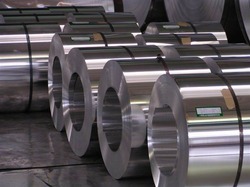 Nandishwar steel offers to clients a premium quality range of Stainless Steel Coils. The range of Stainless Steel Coils is widely appreciated due to its high tensile strength, durability and resistance against corrosion. Grade 304, 304L, 304H, 316, 316L, 316LN, 316Ti, 309, 310S, 317L, 321, 347, 409, 410, 420, 430, 446, 202 Etc. Sheet & Plate in Form of Coils, Foils, Shim Sheet, Perforated Sheet, Chequered Plate, Strip, Flats, Blank (Circle), Ring (Flange) Etc.